Achieve Predator MDC integration for your ERP and MES system with Predator MDC Enterprise’s open APIs (application programming interface). 300+ methods all fully documented. 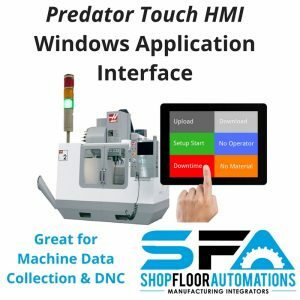 Develop ERP and shop floor validation. Flow your part and job numbers from ERP directly into Predator. Numerous other automation projects can be completed. Use C#, C++, VB.Net, VB6, VB script, Windows Script, Delphi and other compatible programming languages. Touch HMI is described as a big button interface. A Windows application to simplify real-time data collection. It also helps with DNC (drip-feeding) on the shop floor. The interface can be customized with color coding from SFA. Use to improve processes & operation. Collect machine downtimes, scrap reasons, & more data that is crucial for data-driven decision making. Design for assembly lines, test stands, light towers, and more. Use it on Windows PCs & Tablets – replace bar code readers, QR code readers, & hand-held terminals.